Can it be as simple as this? Six weeks ago, at a travel writing conference, Lee Foster mentioned that he'd just launched a new app for iPhone - San Francisco Photographer's Guide - and sold 60 downloads already. Like so many travel writing endeavors these days, this one had generated just a pittance so far for this talented photographer. But...where might it lead? So here we are, Rick and I, now on the verge of launching our own app after a frantic six weeks of research, marketing, web development, picture taking...oh, and some writing. 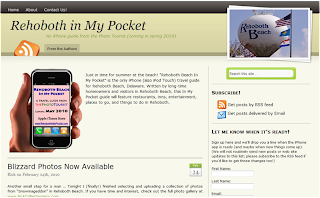 Rehoboth In My Pocket started as an app, then expanded into a web site to help promote the app, then a blog to keep the website alive, then a widget to gather a mailing list of those who'd like to stay in touch with Rehoboth. Soon will come some fun freebies from Rehoboth merchants for app owners and web visitors. And next week I step out of the shadows to volunteer at the Rehoboth Chocolate Festival, where I've been encouraged to hand out my (new) Rehoboth In My Pocket flyers and business cards. We've already announced our plan for the next app: Virginia Wine In My Pocket - and the crazy notion of visiting 150 wineries in 150 days this summer to kick it off. We are getting encouragement and interest from every quarter; everybody wants their own app now. And here we are, holding what may well be the golden ticket to a travel-centric future. I wear a lot of ladies trouser socks. Not all at one time, of course. Just one pair is plenty. I like that they’re thin and don’t bulk up inside my shoes, and that they go all the way to the knee instead of stopping mid-calf, which never made any sense to me. Makes me think of those pictures of rock climbers cheating gravity, leaning backwards while clinging to an overhanging ledge. And anklet socks are even worse; they always leave a draft down below. So I’ve given a lot of thought to this, and trouser socks have been a part of my life for a couple of decades. Unbeknownst to Rick, apparently, who stood kind of slack-jawed – to me, he really looked horrified – as I stooped to pull up my black knee-highs during our morning stroll along the boardwalk in Rehoboth this winter. I thought I read his reactions like a book – no poker face, his: He thought I was wearing supp-hose, like his 75-year-old dad. Like an old lady; a doddering Q-tip who long ago flung fashion to the ground and pulled on her practical tights with the resignation and relief of old age. You can live together for a decade, a lifetime, and still not completely know each other.